At least once, perhaps a few times in your life, you will experience a moment of clarity that transcends whatever you are doing and has a lasting impact on the whole of your brief existence on Earth. For some people, that moment is when they meet their soulmates; others, when they comprehend their greatest abilities for the first time; and still others, when they find the thing that makes them most passionate about life. I count exactly one moment of clarity in my life thus far, and it happened when I was 16 years old. I was a junior taking Mr. Churley’s Art History class, and despite the class being held at an ungodly hour I was one of only a couple other students who actually stayed awake during the occasionally long-winded slide-show lectures. We had covered the art of Ancient Egypt, Greece, and Rome, as well as Byzantine art, and although I found it interesting, I didn’t see myself going to college to pursue a degree in art history. Then Chartres happened. I entered class one January morning and froze. My body was still there, surrounded by neat rows of desks and students rubbing the wrinkles from their eyes; my mind was whisked halfway around the world to an ancient town to the south of Paris. After a brief pause, I stumbled back into consciousness and paid better attention to that lecture than I probably ever would again. I had a revelation that day: I was going to study the amazing cathedrals of Europe, and one day I would see them. 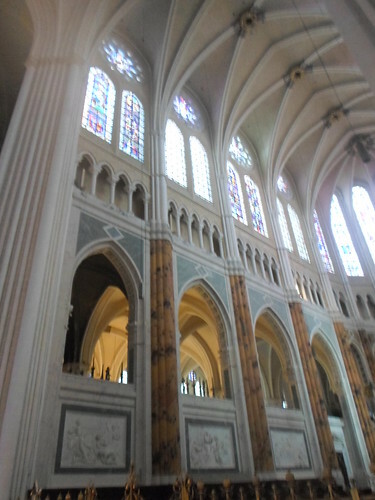 Chartres was always at the top of my list–this incredible church steeped in history, preserved miraculously by the warping effects of time and war, sitting at the top of a small hill not far from where Gothic sprang its first evergreen roots at St. Denis. 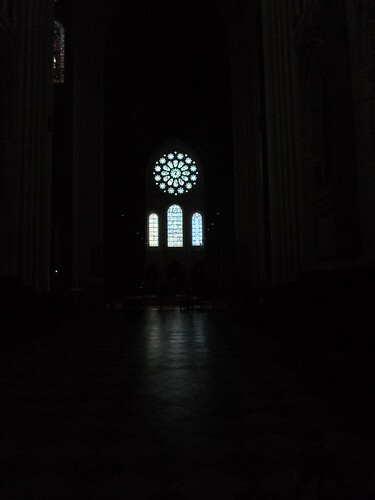 Today, seven years after I first saw Chartres from the small projector screen in my art history class, I finally fulfilled this dream. 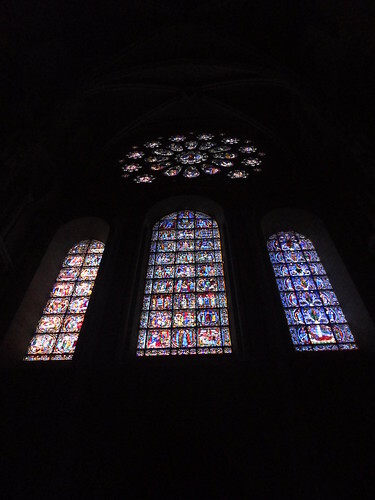 I took the train down from Gare Montparnasse in Paris and arrived at the peak of the afternoon; there could be no better way to beat the heat than by walking into the cool, dark confines of Notre Dame de Chartres. While I did not tremble at the feet of Christ (I am, after all, a fellow Jew), I did hesitate for a moment before entering the church, to soak in the delicious anticipation of wondering what it would be like inside, and to prepare myself for what would lie in front of me. Entering the cathedral at the apex of the midday sun, my eyes took a second or two to adjust to the light–about the same amount of time that it took for me to have my epiphany seven years ago. I still had my old notes from a class I took that covered Chartres in extensive detail, and used them to refer to the story scenes laid out on the glass above. Since these windows are set so high into the walls of the church, it can be quite difficult to decipher the many brilliant story scenes with the naked eye–so Professor McClendon’s extensive knowledge really came in handy. 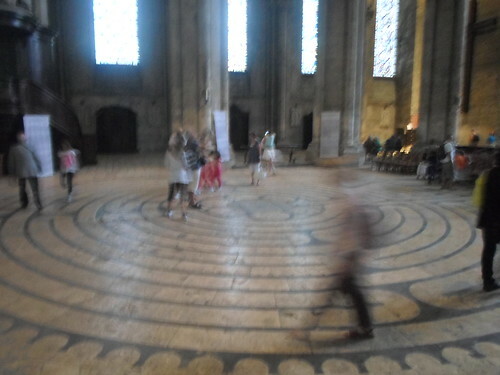 One of the most incredible features of this cathedral is the labyrinth, which people walk along. I would say it takes about 5-10 minutes to complete, walking at a slow, measured pace. There are many layers of significance to the labyrinth. Of course, there’s the cliched one about the path to salvation being varied and twisted–don’t forget, this is the church’s primary function–but one that a lot of people don’t think about is the symbolism of the labyrinth itself. The prodigious–and mostly nameless–architects who built the great cathedrals of Europe were not simple, illiterate craftsmen, but educated and innovative engineers who were the avant garde of their time, no different than we think of architects like IM Pei or Renzo Piano in our own. They were no doubt aware of Daedalus, the creator of the mythic Labyrinth that housed the Minotaur on Crete. The architects at Chartres and at other great cathedrals such as Amiens left their mark in homage to the Divine genius of Daedalus–and no doubt to their own. 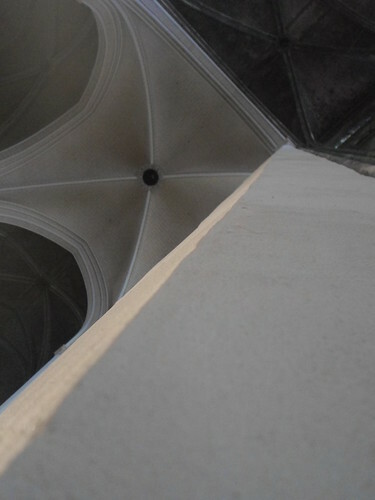 After exiting the labyrinth I wandered toward the crossing, the heart of the Cathedral, and looked straight up–I did a lot of that today, and my neck is slightly soar from straining so much. 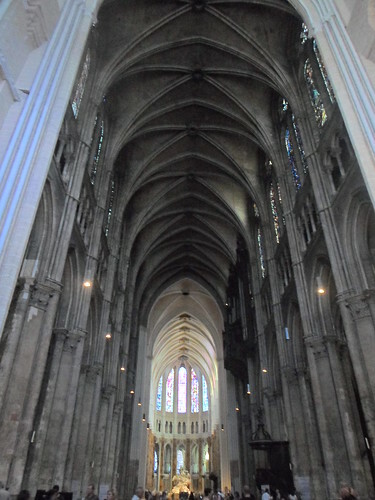 The nave is 121 feet high and is among the tallest in France. Before I left I made my way into the East End of the church, and was surprised to see that visitors are allowed into the choir. This afforded me my favorite shot of Chartres, looking back toward the West End. Seven years ago I was inspired by a picture to study art and ultimately, to go on this journey. Today I stood in that place and concluded one journey, all while beginning my next one: the Camino de Santiago. 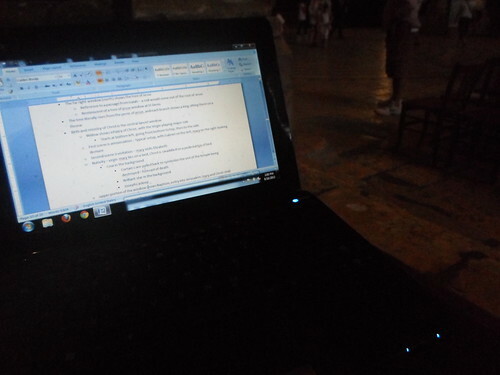 Tonight I take shelter in the Chartres train station, tomorrow I make my way to Vezelay. Hope you sleep better than I do. Posted in Beauty, Food, Gothic, ReflectionTagged art, art history, Chartres, finding purpose, Gare Montparnasse, Gothic, Notre Dame, Paris, pilgrimage, Reflection, sculpture, stained glass, travelBookmark the permalink. Bravo, Nathan. Can you tell us where the restoration was when you were there? Were they working in the transepts. Also, did you take Malcolm Miller’s tour of the windows? Hello Nathan! Dennis and I are living vicariously through you! The idea of being at Vezelay brings so many memories to mind. She will take your breath and heart away. Dennis and I are living vicariously through your journey. The thought of Vezelay brings so many powerful memories to mind. She will capture your heart. Hi PJ, how great to hear from you as well! I was wondering if you did everything but go online. I am really excited to see it tomorrow. As discussed earlier, it sounds like I just have to find the Cure and ask them to let me up. I know on Sunday the services will probably keep me from exploring, but I don’t plan to start until Monday so I should hopefully get to see it first thing on Monday? You’re the expert though, not me! To answer your questions Dennis, they have completed the choir, are at work in the ambulatory and have partially completed the crossing. Since the restoration is being carried out by people with a very high degree of familiarity with Chartres I don’t have any doubt they’re using the right shade of ochre yellow and blue paint, only using the gentlest painting methods, etc–although part of me does have mixed feelings about adding on something new to a building that was already perfect in my eyes. This is different from the project at Saint Chapelle, where they are cleaning the glass and only if ABSOLUTELY necessary scrapping the old lead parts for new ones. The grumpy art history major in me thinks the restoration in some ways is sort of a Disney-fication, if you will–look folks, we did our best to recreate what the Cathedral looked like 850 years ago! 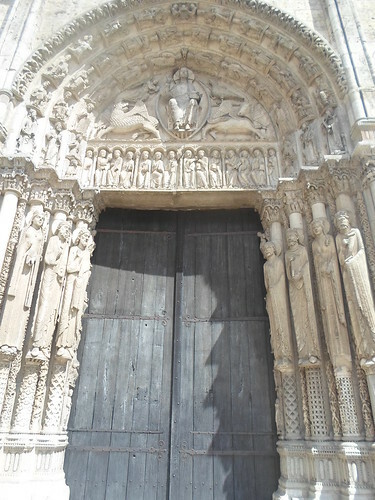 !–especially when you consider that the architects were probably pragmatic enough to realize just as most of the Roman buildings around them were in some form of ruin, perhaps the same (knock on wood, of course), would happen at Chartres. Will fans of Robert Smithson one day gather at Salt Lake to rebuild his Spiral Jetty? I don’t think he would want that. 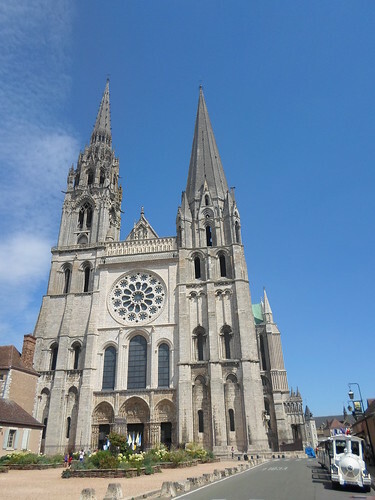 I guess it raises a question of decay in art and architecture–it is perfectly normal for centuries of wear from pilgrims, soot from burning candles, angry revolutionaries (well, not so normal), and time itself to slowly erode a building like Chartres. Where is the line between restoration/rejuvenation and simply playing to the tourists and lacking respect for the great work of art that it is? I’m sure in your work you’ve come across a couple examples that went over that line. I would definitely like to hear your thoughts, on the restoration taking place at Chartres and where the line may be. And sadly, I missed Mr. Miller’s tour. However, as I mentioned in this post I did have my notes from class. Professor McClendon was an exceptional lecturer, and I was a very good listener!